Well, lovely readers, I am back in California and getting back into regular life after my second and final session of training in spiritual direction. I hope you’ve enjoyed the last three weeks of guest posts as much as I have! We will continue to have Five Questions on… every Friday for as long as we still have willing participants. Everyone is welcome, so please feel free to share your responses and add your voice to the conversation. I had some grand ideas for launching back into regular posting here at HBTB, but I’m afraid I’ve suffered from technical difficulties (three laptops in three weeks!). For today, let’s enjoy this little snippet from the ever-wise Rainer Maria Rilke on the connection of the spiritual and the physical through experiencing our sexuality. We can recall that all beauty in animals and plants is a silent and enduring form of love and longing. We can see the animal just as we perceive the plant, patiently and willingly uniting, multiplying, and growing, not from physical desire, not from physical grief, rather from adapting to what has to be. That existing order transcends desire and grief and is mightier than will and resistance. The earth is full of this secret down to her smallest things. Oh, that we would only receive this secret more humbly, bear it more earnestly, endure it, and feel how awesomely difficult it is, rather than to take it lightly. Perhaps the sexes are more closely related than one would think. Perhaps the great renewal of the world will consist of this, that man and woman, freed of all confused feelings and desires, shall no longer seek each other as opposites, but simply as members of a family and neighbors, and will unite as human beings, in order to simply, earnestly, patiently, and jointly bear the heavy responsibility of sexuality that has been entrusted to them. Thoughts? Questions? Reactions? Share in the comment box below. 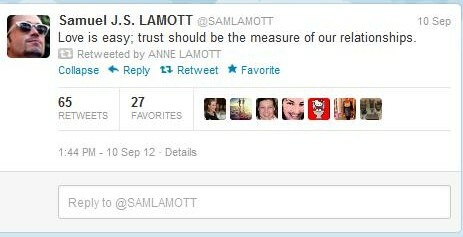 I saw this tweet last week on Anne Lamott’s feed, and I got to thinking. In grad school, I took a class called Marriage and Interpersonal Relationships in which the professor talked about how people at bottom have either struggles with shame or trust issues. Everyone has a little of both, but either shame or trust is the key component in why we think the way we think, why we act the way we act, and why we end up in the conflict cycles in relationships that we end up in. After a lot of soul-searching (and a paper we had to write), I finally came to the conclusion that I am a trust-issue person. Somehow, being a shame-issue person seemed better or easier to admit, but when I finally realized the truth about my own woundedness, I began to take steps toward my healing. I did a lot of work on myself after that, which took years. I remember something a close friend once said about the healing she experienced in her life (as a shame-issue person). She said that the final healing came from her husband. That’s what I thought of when I read that tweet the other day. I thought about all the work I did to undo the learning I had learned growing up that no one was trustworthy and that I had to take care of everything myself. I thought about all the work I did to learn to do more than say the words with my mouth that God is trustworthy; I also had to believe it in my heart. But at the end of the day, the final healing came from my relationship with my husband. When I read that tweet, I thought about how I trust my husband implicitly and completely without the slightest twinge of doubt, suspicion, or jealousy. If he says he’s working late, I know that means he is. If he chats on Facebook with an old girlfriend, I know they really are just friends. I know because every single day since the day we met he has proven with his behavior that I can trust him. I know because even when some embarrassingly irrational fear emerged while we were dating, and I acted out, he said the words I needed him to say and behaved the way I needed him to behave to prove to me again that I can trust him. I know because if he could see the irrational, embarrassing side of me with all the woundedness still left unhealed and still want to date me and marry me and love me forever, he was worthy of my trust. And it made me think about God, too, and how hard it is for me to trust God. It’s easy to love God, serve God, praise God. But trust? For some people, believing that God loves them, that they are love-able, is the hardest thing. For me, believing God is trustworthy (especially believing that I don’t have to earn it) is the hardest thing. I’ve been slowly healing from this great lie I believed for years, but the final healing came from my husband. My aunt once said, famously, that sometimes we just want someone with skin on. Sometimes, no matter how many Bible verses we memorize or how much theology we learn about who God is and who we are, we just can’t accept the truth until we receive it from someone with skin on. That is the beauty of the incarnation. God poured all of that majesty and might and holiness and completeness and divinity into one small, simple, ordinary human being. After everything we had learned, after all our God-encounters throughout history, we just couldn’t get it until we actually saw, felt, heard, and sat at the feet of someone with skin on. If my husband — a fallible human being just like I am — can be this honest, this dependable, this trustworthy, then SURELY how much more so is the God we love and serve and praise? I’m no fool. I don’t expect my husband to be perfect. I know he is not God. I know he will let me down, hurt me, disappoint me, and maybe even betray my trust in him one day. But through his physical presence in my life, I have been able to experience the truth about who God is. All the Bible verses in the world couldn’t do that. 9 What do workers gain from their toil? 10 I have seen the burden God has laid on the human race. 11 He has made everything beautiful in its time. He has also set eternity in the human heart; yet no one can fathom what God has done from beginning to end. 12 I know that there is nothing better for people than to be happy and to do good while they live. 13 That each of them may eat and drink, and find satisfaction in all their toil—this is the gift of God. 14 I know that everything God does will endure forever; nothing can be added to it and nothing taken from it. God does it so that people will fear him. 22 So I saw that there is nothing better for people than to enjoy their work, because that is their lot. For who can bring them to see what will happen after them? What season of life are you in? How do you find balance in this season of life? 2) Even with makeup, I’m not pretty. 3) I need to lose weight. 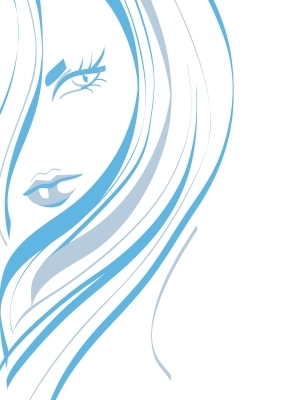 4) I have too much hair in the wrong places. 5) I am responsible for how men react to the way I look. 6) Dressing in clothes that aren’t baggy is immodest. 7) Showing my legs or arms is immodest. 8) I should be ashamed of myself for wanting to look pretty. 9) My husband is not really attracted to me. 10) I’m not feminine enough.